Truck owners and drivers say they have taken a big hit since the GST was rolled out six days ago. Originally from Uttar Pradesh, Mohammed Azim moved to Delhi 3 years ago to eke out a living for himself. With bank loans, he bought two trucks worth Rs. 12 lakhs each to ply across India’s states transporting everything from metal pipes to cement to personal household goods. His plans however seem to have hit the wall following the implementation of Goods and Services Tax or GST. “There hasn’t been any work for the last five days, we’ve just been sitting idle. No work, no customers, no goods,” Mr Azim said. 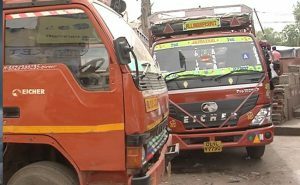 His frustrated voice is echoed by a large group of drivers standing with him at the Ajmeri Gate truck depot in Central Delhi. Truck owners and drivers say they have taken a big hit since the GST was rolled out six days ago. Up till last month each of their trucks was out on the road every single day, bringing in an average profit of Rs. 60,000 per month per truck. But since July 1st, there has been absolutely no work for them. “If there’s no work, there’s no income,” says Kailash, who has been driving trucks for the last 15 years. He is the sole earning member in a family of five. The truckers say they have no clue on how the new tax regime works. “Since the GST has been rolled out, we’ve been clueless. We have to get a GST number or something, but we don’t even know what GST really means,” says Rakesh, a manager at the Nav Bharat Transport Company which owns six trucks. Drivers are paid Rs. 7000-10000 a month along with meal charges for their services. “At least here drivers get money for three meals a day. If they go back to their villages, there’s no work there, they won’t even manage that much,” says Rajkumar, manager at Sri Hari Transport Limited. Truck owners say they usually make a profit of Rs. 1,500-2,000 per truck per day. But since July 1st there has been no work coming in, therefore no profits and no money to pay their drivers. GST or Less traffic: what led to cut inter-State truck travelling time?